An area that posed a fire risk is now home to fire-resistant plants. The corner of Aliso & Wood Canyons Wilderness Park in Laguna Beach, Calif., previously was a field of invasive vegetation that posed a significant fire risk. The area is no stranger to fire damage, with 366 homes and nearly 17,000 acres destroyed by an arsonist-set blaze in 1993. After a renovation, the corner, which is adjacent to an elementary school, now abounds with native and more fire-resistant and drought-tolerant plants. The project was funded by a $103,500 grant from the U.S. Forest Service and in-kind donations totaling $37,500. The previous overgrowth has been replaced with 20 trees, approximately 60,000 square feet of ground cover and 700 shrubs and perennials, including California sunflowers and coastal prickly pear cactus. In addition to fire prevention, the new landscaping is intended to reduce maintenance by preventing the re-growth of weeds and annual disking. An irrigation system also was installed. The project has not only reduced the risk of fire and aesthetically improved the park, but also is an example of community cooperation. 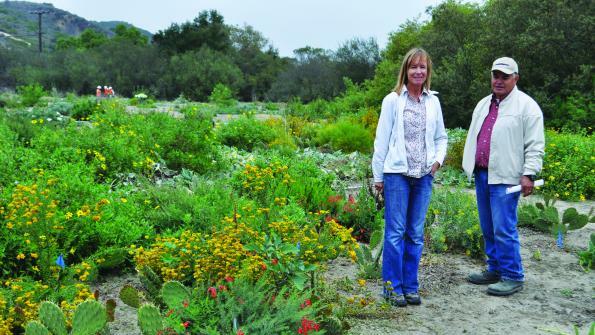 While the property is owned by Orange County Parks, the transformation was led by the Greater Laguna Coast Fire Safe Council, a non-profit formed following the 1993 fire. A number of local government agencies participated, including the city fire department and water district, as well as the county parks and fire authority. The neighboring private elementary school volunteered to pay the ongoing irrigation costs. The partners hope the corner will serve as a reminder about the importance of fire prevention measures.